This liquid light reflecting highlighter glides on and becomes one with your skin to enhance your complexion and create a shimmering incandescence. Can be worn alone or underneath your makeup to transform your look from ordinary to extra-ordinary. Apply evenly on your face and body as an all over glow or on the high points of the face like the cheekbones and the nose bridge. 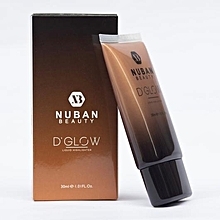 Can be mixed with your primer, body oil or foundation for added radiance.